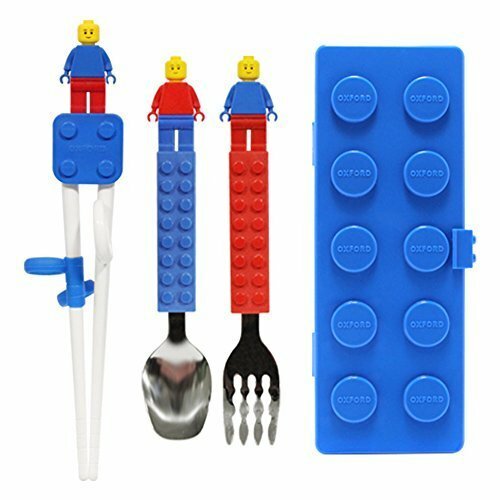 This Children Flatware featuring Oxford Brick Figure on the 6.5 inch size stainless Fork & Spoon Set. It is compatible with other brick brands. Easy grip design makes fork and spoon easy for little hands to hold. Promotes self feeding Rounded fork and spoon for safe feeding. If your children are fussy on the meal table, it is the right choice with this utensil items. You won't regret and just try out! Easy grip and it is the best utensil set for kids to practice by themselves. 2.6 inch Fork and Spoon, 8.3 inch Chopstick, 3.2 inch Case / DO NOT PUT IN THE DISH WASH MACHINE. Non-Slip shape Chopstick and it is easy to practice for right hand. Chopstick helps to develop children's brain activity. 2 EXTRA FIGURES INCLUDED - Included brick figure emphasize children's interest in the meal time. Curved line Fork and Spoon design for easy to use.